Obesity is associated with the development of insulin resistance an important etiology of type 2 diabetes mellitus (T2DM) which also leads to other pathological conditions including hypertension, atherosclerosis, and coronary heart disease. In addition, people with obesity are at an increasing risk of having a nonalcoholic fatty liver disease (NAFLD), a condition described by hepatic triglyceride accumulation without overwhelming alcohol consumption. There is a study to show that adipose tissue has a role in regulating energy homeostasis as well as a development of insulin resistance. The long-term intake of high-fat diet (HFD) can cause hypertrophy and, subsequently, dysfunction of adipocytes,. An increased influx of free fatty acid (FFA) into hepatic tissues occurs when serum FFA is over the normal level, causing the NAFLD or hepatic steatosis. This consequently leads to an insulin resistance and an increased gluconeogenesis within the liver. It has been reported that the insulin resistance with a high insulin level can stimulate the transcription factors regulating hepatic lipogenesis and β -oxidation. The sterol regulatory element-binding protein 1c (SREBP1c), especially, is one of the transcription factors responsible for an increase of hepatic lipogenesis by stimulating the lipogenic enzymes such as fatty acid synthase (FAS) and acetyl-CoA carboxylase (ACC),. Overall, the increases of FFA, insulin level, hepatic lipogenesis transcription factors and enzymes altogether play the intertwining roles in the underlying mechanism of the NALFD. (BO) is an edible plant in the cabbage family with its large flowering head often eaten and regarded as vegetable. It exhibits several bioactivities such as anticancer, antioxidant, neuroprotective, and renoprotective activities. However, there is no report to show the effect of BO extract in obesity condition. Therefore, this study was designed to evaluate its roles on an improvement of glucose and lipid homeostasis in HFD-fed mice as well as to elucidate the possible underlying mechanism. BO head was collected from Chiang Mai, January 2017. A botanical specimen was identified by the Faculty of Pharmaceutical Sciences, Rangsit University, Thailand. The dried BO was extracted with dichloromethane for 30 min. The extract was evaporated, concentrated and subsequently freeze-dried. The yield was calculated to be 9.50%. BO was then suspended in 5% gum arabic. Thirty-two male ICR mice (weight 20-25 g) were purchased from the National Laboratory Animal Center of Mahidol University, Nakhon Pathom, Thailand. They were housed in a temperature-controlled facility (25 ± 2) °C under a 12-h dark-light cycle. They had free access to low-fat diet containing 10 kcal% lard fat (D12450H, Research Diets, New Brunswick, NJ, USA) and water ad libitum for a week, prior to the study. The experimental protocols were approved by the Animal Ethics Committee of Srinakharinwirot University, Bangkok, Thailand (Rec. No. 6/2559). All the mice were divided into 4 groups (8 mice per group): normal control group, obese model group, treatment group with BO at 100 and 200 mg/kg/day. For the normal control group, mice were fed a low-fat diet for 16 weeks. The induction of obesity was done as described previously. The obese mice group was fed with a HFD containing 45 kcal% lard fat (D12451, Research Diets, New Brunswick, NJ, USA) for 16 weeks. After 8 weeks of HFD feeding, the obese condition was confirmed by measuring the body weight and intraperitoneal glucose tolerance test (IPGTT). Eight weeks later, normal control mice in the first group were orally administered with 5% gum arabic. Obese model mice in the second group were orally administered with 5% gum arabic. Obese mice in the third and fourth groups were orally administered with BO at 100 and 200 mg/kg/day, respectively. The treatments were continued for 8 weeks. Body weight and food intake were checked once a week. After 8 weeks of study period, the mice were fasted for 6 h and anesthetized by isoflurane inhalation. Whole blood was drawn from heart for checking the fasting blood glucose (FBG) level. The rest of whole blood was centrifuged and the serum samples were collected for checking the metabolic parameters. The liver was removed for further biochemical and gene examinations as described below. After 8 weeks of treatment, 6-h fasted mice were intraperitoneally injected with 1.0 g/kg of glucose solution. Blood samples were collected from the tail vein before glucose injection and after glucose injection at 20, 60, and 120 min. Blood glucose levels were checked by an automatic glucometer (Accu-Check; Roche Diagnostics, Mannheim, Germany). The concentrations of serum insulin and leptin were examined using the ELISA kit assay (EMD Millipore, MA, USA). The commercial kits from Wako (Osaka, Japan) were used for measuring the levels of serum total cholesterol (TC), triglyceride (TG), and non-esterified fatty acid (NEFA). The liver TG and NEFA contents were determined as described previously with some modifications. The commercial kits from Wako (Osaka, Japan) were used for measuring the concentrations of liver TG and NEFA. The liver tissue was used for extraction of total RNA and synthesis of cDNA by method that has been described previously. The gene expression was performed with a StepOnePlus™ Real-Time PCR system using TaqMan Gene Expression Master Mix Kit (Applied Biosystems, CA, USA). The probes and primer sequences were designed by the Applied Biosystems. All mRNAs were normalized to the level of glyceraldehyde-3-phosphate dehydrogenase (GAPDH) and calculated using the comparative computed tomography (CT) method with the formula 2-ΔΔCt. Results were presented as mean ± SEM. The data were calculated using one-way analysis of variance (ANOVA) followed by Tukey's post-hoc test (Systat Software, CA, USA). P-value < 0.05 indicated statistically significant difference. The amount of food intake of all the obese groups was significantly lesser than that of the normal control mice [Table 1]. The BO-treated groups did not affect the average food intake as compared to the obese control group [Table 1]. In obese control group, the body weight was significantly increased when compared with the normal control group [Table 1]. Interestingly, the BO-treated groups showed the body weight reduction as compared to the obese control group; although this finding was not significant statistically. Table 1: Effect of BO on metabolic parameters in HFD-induced obese mice. The obese control group had the high FBG throughout the duration of 8 weeks of study period [Table 1]. Compared to the obese control group, the FBG was significantly reduced in BO-treated groups (P < 0.05). Moreover, the administration of BO (100 and 200 mg/kg) significantly reduced the insulin and leptin levels compared to the obese control group [Table 1]. The IPGTT showed that the blood glucose level was increased in obese control group as compared to the normal control group [Figure 1]. However, it was found that the BO-treated groups could suppress the rising glucose levels at every time point after glucose loading (P< 0.05) when compared to the obese control group. Figure 1: Effect of BO on IPGTT in HFD-induced obese mice. Data are expressed as mean ± SEM (n = 8). #P < 0.05 compared with normal control group. *P < 0.05 compared with obese control group. NC: normal control mice, OB: obese control mice, BO: Brassica oleracea extract. Levels of serum TC, TG and NEFA were significantly reduced in the BO-treated groups in comparison with the obese control group [Table 2]. Furthermore, the contents of hepatic TG and NEFA were also significantly decreased in BO-treated groups [Table 2]. Table 2: Effect of BO on serum and liver lipid profiles in HFD-induced obese mice. As shown in [Table 3], the gene expressions of SREBP1c, FAS and ACC were significantly elevated in the obese control group compared to the normal control group. The elevation in the expressions of these genes was significantly reduced by BO treatments. In addition, the obese mice treated with BO at both doses even showed significantly lower expressions of lipogenic genes compared to the normal control group [Table 3]. Table 3: Effect of BO on hepatic lipogenesis gene expressions in HFD-induced obese mice. Obesity is related to the insulin resistance development, a condition in which insulin-dependent cells cannot uptake and utilize glucose. Both obesity and insulin resistance often progress to more serious conditions such as T2DM and coronary heart disease. Individuals with the insulin resistance usually develop hyperglycemia, glucose intolerance, hyperinsulinemia, and hyperleptinemia. Our study aimed to determine the effect of BO extract on the insulin resistance found in the obese subjects. We thus conducted the experiments using the obese mouse model. In this study, mice fed with a HFD not only had significantly increased body weight but also showed the state of hyperglycemia, hyperinsulinemia, hyperleptinemia and hyperlipidemia. The present study indicates that the HFD-induced obese mice developed the condition of insulin resistance. This model was thus suitable for investigating effects of BO extract on glucose and lipid homeostasis in obesity condition. At the end of 16 weeks after feeding with HFD, the body weight of the obese control mice was found to be elevated. Administration of BO could lower the body weight of the obese mice (even not statistically significant) despite similar amounts of food consumption among the obese groups. This suggested that taking BO may help with controlling body weight in the HFD-induced obese subjects. Insulin and leptin are important mediators affecting the energy storage as fat. The relationship between obesity and insulin resistance is generally acknowledged,. Excess energy consumption especially carbohydrates contributes to both weight gain and the constant hyperinsulinemia. The insulin resistance develops when insulin sensitivity in insulin-dependent tissues is decreased despite having the elevated systemic concentration. Individuals with prolonged insulin resistance eventually develop T2DM,. Our study found that the HFD-induced obese mice developed hyperglycemia and hyperinsulinemia - the characteristics of insulin resistance. Interestingly, it was found that obese mice receiving BO at 100 and 200 mg/kg had significantly lower blood glucose level as measured by both FBG and IPGTT at 20, 60, 120 min compared to the obese control mice. A significant lower insulin level was also found in obese mice receiving BO at both doses. This indicates that BO extract can alleviate the progression of insulin resistance in the obese mice. Like insulin resistance, obese individuals usually develop resistance to leptin as well. The impairment of leptin responses and reduction of leptin receptor are the characteristics of leptin resistance, resulting in failure to control hunger despite the high circulating concentration of leptin,. There has been reported that the improvement of leptin sensitivity is associated with the decreased body weight and food intake in obesity,. Improvement of leptin sensitivity is important for reduction of leptin receptor overstimulation. This study showed that mice fed with HFD had significantly higher level of serum leptin when compared to the mice fed with low-fat diet. Interestingly, obese mice with BO treatment significantly reduced the serum leptin levels as compared to the obese mice without BO treatment. As leptin resistance is often associated with obesity, it is thus possible that the body weight reduction in the obese mice treated with BO resulted in the improvement of leptin function. In individuals with insulin resistance and obesity, hyperlipidemia and hepatic lipid accumulation are conditions commonly found,. Our study showed that the obese mice had significantly higher serum lipid profiles (TC, TG and NEFA) compared to the normal control mice. In addition, the increases of hepatic TG and NEFA storage were significantly detected in the obese mice, suggesting the development of NAFLD in these subjects. However, after 8 weeks of BO treatments, the hyperlipidemia as well as the increased hepatic TG and NEFA storage were significantly reduced. It is generally accepted that the elevation of fatty acid synthesis and the reduction of fatty acid oxidation are the two important mechanisms responsible for the TG accumulation in the hepatocytes. SREBP1c is an important transcription factor that is required for fatty acid uptake and biosynthesis, and it acts by stimulating the FAS and ACC lipogenic enzymes,. In this study, the gene expressions of SREBP1c, FAS and ACC were significantly increased in the obese control mice compared with the normal control mice. Interestingly, the obese mice treated with BO (100 and 200 mg/kg) showed significant decreases of these gene expressions compared to the obese control mice. It is possible that the BO extract decreased the expression of SREBP1c transcription factor, resulting in the decreased expressions of ACC and FAS lipogenic enzymes. The suppression of these genes is likely to be responsible for the decreased hyperlipidemia and hepatic lipid accumulation (TG and NEFA) as found in the obese mice treated with BO extract. In conclusion, we show that the administration of BO improves the impairment of glucose and lipid homeostasis in HFD-induced obese mice by inhibition of hyperglycemia, hyperlipidemia, hyperinsulinemia and hyperleptinemia. Improvement of glucose and lipid homeostasis by BO extract is associated with the reduction of lipogenic gene expressions (SREBP1c, FAS and ACC). In addition, we did not observe any health problems or side effects (i.e. diarrhea) in mice with long-term oral administration of BO. Therefore, the administration of BO extract may be a new therapeutic agent for restoring impaired glucose-lipid homeostasis in HFD-induced obesity condition. Ormazabal V, Nair S, Elfeky O, Aguayo C, Salomon C, Zuñiga FA. Association between insulin resistance and the development of cardiovascular disease. Cardiovasc Diabetol 2018; 17(1): 122. Perla FM, Prelati M, Lavorato M, Visicchio D, Anania C. The role of lipid and lipoprotein metabolism in non-alcoholic fatty liver disease. Children (Basel) 2017; 4(6): 46. Choe SS, Huh JY, Hwang IJ, Kim JI, Kim JB. Adipose tissue remodeling: Its role in energy metabolism and metabolic disorders. Front Endocrinol (Lausanne) 2016; 7: 30. Naowaboot J, Piyabhan P, Munkong N, Parklak W, Pannangpetch P. Ferulic acid improves lipid and glucose homeostasis in high-fat diet-induced obese mice. Clin Exp Pharmacol Physiol 2016; 43(2): 242-250. Naowaboot J, Wannasiri S, Pannangpetch P. Morin attenuates hepatic insulin resistance in high-fat-diet-induced obese mice. J Physiol Biochem 2016; 72(2): 269-280. Benedict M, Zhang X. Non-alcoholic fatty liver disease: An expanded review. World J Hepatol 2017; 9(16): 715-732. Petersen MC, Vatner DF, Shulman GI. Regulation of hepatic glucose metabolism in health and disease. Nat Rev Endocrinol 2017; 13(10): 572-587. Wang Y, Viscarra J, Kim SJ, Sul HS. Transcriptional regulation of hepatic lipogenesis. Nat Rev Mol Cell Biol 2015; 16(11): 678-689. Kim CW, Addy C, Kusunoki J, Anderson NN, Deja S, Fu X, et al. Acetyl Coa carboxylase inhibition reduces hepatic steatosis but elevates plasma triglycerides in mice and humans: A bedside to bench investigation. Cell Metab 2017; 26(2): 394-406. Moslehi A, Hamidi-zad Z. Role of SREBPs in liver diseases: A mini-review. J Clin Transl Hepatol 2018; 6(3): 332-338. Strable MS, Ntambi JM. Genetic control of de novo lipogenesis: Role in diet-induced obesity. Crit Rev Biochem Mol Biol 2010; 45(3): 199-214. 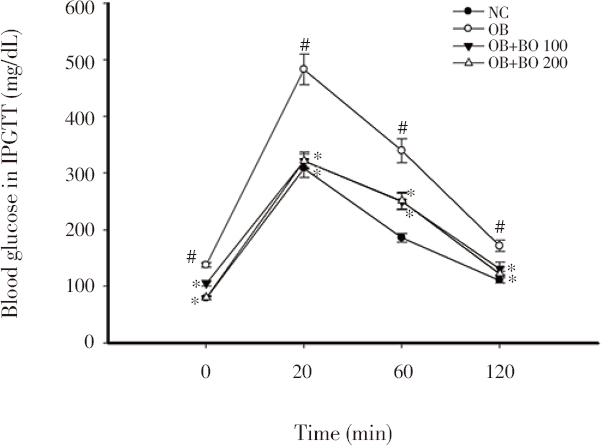 Cakar J, Paric A, Maksimovic M, Bajrovic K. Antioxidative and antitumor properties of in vitro-cultivated broccoli (Brassica oleracea var. italica). Pharm Biol 2012; 50(2): 175-181. Srivastava RA, Pinkosky SL, Filippov S, Hanselman JC, Cramer CT, Newton RS. AMP-activated protein kinase: An emerging drug target to regulate imbalances in lipid and carbohydrate metabolism to treat cardio-metabolic diseases. J Lipid Res 2012; 53(12): 2490-2514. Fujii N, Ho RC, Manabe Y, Jessen N, Toyoda T, Holland WL, et al. Ablation of AMP-activated protein kinase alpha2 activity exacerbates insulin resistance induced by high-fat feeding of mice. Diabetes 2008; 57(11): 2958-2966. Rubattu S, Di Castro S, Cotugno M, Bianchi F, Mattioli R, Baima S, et al. Protective effects of Brassica oleracea sprouts extract toward renal damage in high-salt-fed SHRSP: Role of AMPK/PPARalpha/UCP2 axis. J Hypertens 2015; 33(7): 1465-1479. Oakes ND, Thalen PG, Jacinto SM, Ljung B. Thiazolidinediones increase plasma-adipose tissue FFA exchange capacity and enhance insulin-mediated control of systemic FFA availability. Diabetes 2001; 50(5): 1158-1165. Naowaboot J, Wannasiri S. Anti-lipogenic effect of Senna alata leaf extract in high-fat diet-induced obese mice. Asian Pac J Trop Biomed 2016; 6(3): 232-238. Tsai JP. The association of serum leptin levels with metabolic diseases. Ci Ji Yi Xue Za Zhi 2017; 29(4): 192-196. Hussain Z, Khan JA. Food intake regulation by leptin: Mechanisms mediating gluconeogenesis and energy expenditure. Asian Pac J Trop Med 2017; 10(10): 940-944. Wauman J, Zabeau L, Tavernier J. The leptin receptor complex: Heavier than expected? Front Endocrinol 2017; 8: 1-20. Oswal A, Yeo G. Leptin and the control of body weight: A review of its diverse central targets, signaling mechanisms, and role in the pathogenesis of obesity. Obesity 2012; 18(2): 221-229. Wu Y, Yu Y, Szabo A, Han M, Huang XF. Central inflammation and leptin resistance are attenuated by ginsenoside Rb1 treatment in obese mice fed a high-fat diet. PLoS One 2014; 9(3): e92618. Yu Y, Wu Y, Szabo A, Wu Z, Wang H, Li D, et al. Teasaponin reduces inflammation and central leptin resistance in diet-induced obese male mice. Endocrinology 2013; 154(9): 3130-3140. Trouwborst I, Bowser SM, Goossens GH, Blaak EE. Ectopic fat accumulation in distinct insulin resistant phenotypes; targets for personalized nutritional interventions. Front Nutr 2018; 5: 77.